The Carnation is a native of central and Southern Europe. Since its introduction into England it is said to have escaped cultivation and to have become fixed in several localties. In its cultivation three general classes have been established by English specialists. The selfs are planted whose flowers have a uniform color. The flakes possess a pure ground of white or yellow, flaked or striped with one color, the stripes running longitudinally through the petals. The bizarres are such as have a pure ground, marked as in the flakes, but with two or three colors; this form possesses the most fragrance, especially when there is a frequent recurrence of the stripes. Lastly, there are the picotees, having a pure ground, each petal being bordered with a band of color. This last form includes many of the rarest varieties, and the yellow picotee is famous in several royal establishments. It is a peculiar fact that rain will injure the colors of the more delicate varieties, and the florist must shield the opening flowers from direct sunlight if he would obtain the best results. In the perfect flower, the pod and calyx should be long, the flower circular, not less than three inches in diameter, rising gradually towards the center, so as to form a sort of crown. The outer petals should be large and few in number, rising slightly above the calyx and spreading horizontally, the other petals being regularly disposed above them, nearly flat, diminishing in size towards the center. The ground should be a pure color and the petals wax-like. 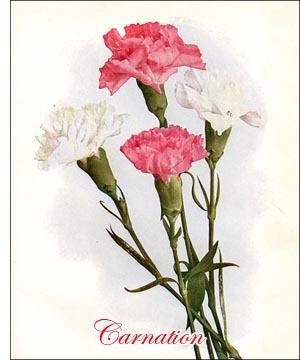 The carnation is allied to the pink family, and consequently is related to the modest Indian pink, the Chinese pink, and the Sweet William. These lowly forms doubtless nourish a secret pride in their relationship to the illustrious head of the house, concerning which Shakespeare said, " The fairest flowers of the season are our carnations."